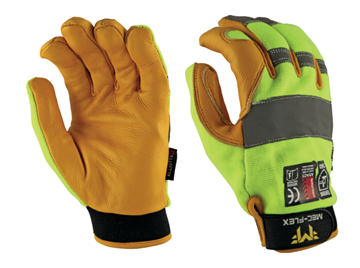 The Mec-Flex® Utility Gold C5 360 offers the combination of 360° or total palm, back of hand and finger wall Cut 5 performance with a soft durable leather palm and breathable Spandex back of hand. The Mec-Flex® Oiler LX offers the combination of 360° C5 protection or total palm, back of hand and finger wall Cut 5 performance with a soft durable leather palm. 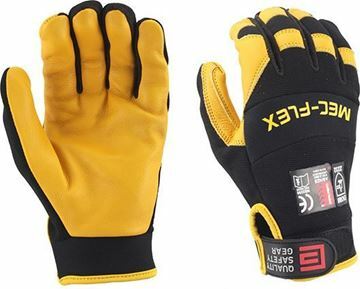 The Mec-Flex® Utility Gold Mechanics Gloves offers the durability of a leather riggers glove is a soft but durable goat skin grain leather and breathable Spandex back of hand. 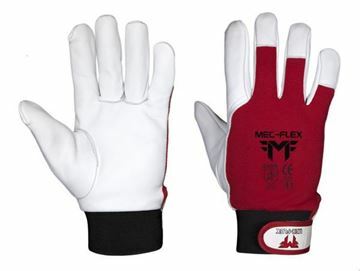 Mec-Flex Rigger GT Mechanics Glove. 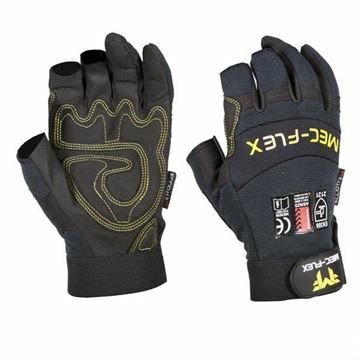 Mec-Flex® Rigger GT an extremely comfortable goat skin leather riggers style mechanics glove. Mec-Flex Oiler Pro C5 Mechanics Glove. The Mec-Flex® Oiler Pro offers the next level of protection in the Oiler Series incorporating Hyde-Tex C5 which gives you the highest levels of Abrasion, Cut and Tear resistance. The Mec-Flex®. 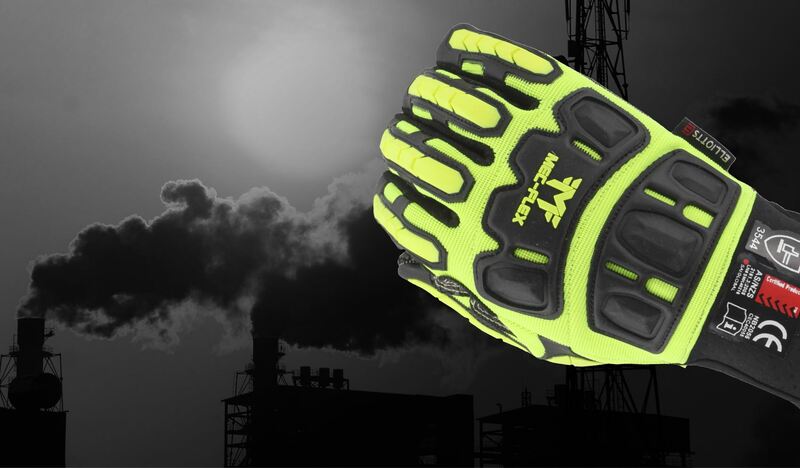 Oiler is the all-rounder glove for the Oil & Gas and Mining Industries offering exception top of hand and finger protection with a palm design offering grip, high tear and excellent abrasion resistance. 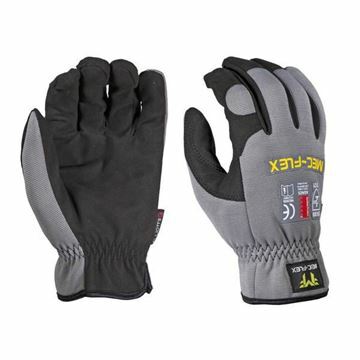 Mec-Flex® Utility Pro is a comfortable form fitting glove designed for general day-to-day handling tasks. The reinforced palm increased durability and protection while the elastic cuff and Hook and Loop TRP closure tab provide a secure fit. Mec-Flex Utility Pro Full Finger Glove. Mec-Flex® QuickFit is a simple but effective toolbox basic. 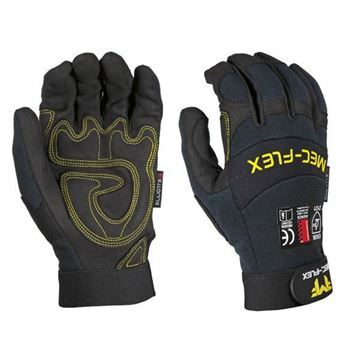 A versatile and economical glove with a multitude of uses for the professional and the handyman. 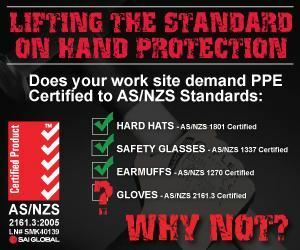 The Mec-Flex® VibraPlus Anti-Vibration glove is a full fingered heavy duty glove made from premium cowhide with a unique anti-vibration padding in the fingers, thumb and palm. Mec-Flex® Utility High Vis is a comfortable form fitting glove designed for general day-to-day handling tasks where you need to be seen. The single layer Hyde-Tex 85 palm has silicon fingertips to provide additional grip. The elastic cuff and Hook and Loop TRP closure tab provide a secure fit. 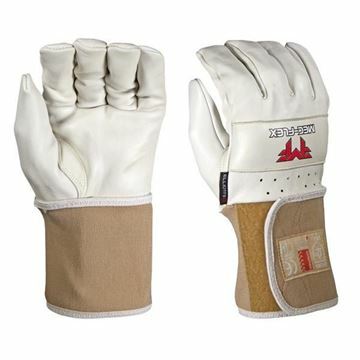 The Goatskin Grain gloves are made with extra soft leather meaning an outstanding fit and dexterity, while also being extremely durable. The Mec-Flex® Utility Gold C5 360 offers the combination of 360° or total palm, back of hand and finger wall Cut 5 performance with a soft durable leather palm and breathable Spandex back of the hand.